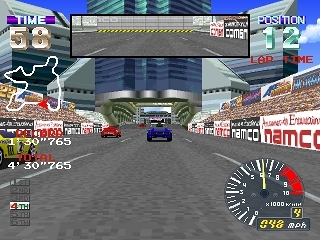 A year after the release of Ridge Racer, Namco released the follow-up game, Ridge Racer Revolution. The sequel cleans up the graphics a little bit and adds a much-needed rear view mirror. Everything that made Ridge Racer a great game is still present in the sequel, as Namco did little to mess with a winning formula. Unfortunately it still follows the same format of using variants of the same race track. This was fine for the launch title, but by now it really would have been nice to have three unique tracks. The game also still features the same cars. As in the previous installment, it is possible to unlock new cars by completing the loading screen mini-game, but these extra cars do little in the long run to add to the replay value. Bumping into the rear half of another car (even if on the side) still causes your car to slow down too much, and the new game announcer is really annoying. One new feature that definitely adds replay value is the addition of link cable support. By linking two Playstation systems together, 2 players could race each other on two of the unlockable tracks from the first game. Ridge Racer Revolution is a great arcade racing game but had I paid full price for it in 1996 to upgrade from the original game, I would have been dissatisfied. The game is simply not improved in any appreciable way, and is more of a track expansion pack than a full blown sequel. That being said, it is definitely worth owning for any arcade racing fan considering how cheap the game is now. Buy Ridge Racer Revolution on GameGavel or Amazon. Tagged 1996, Arcade, Namco, Playstation, PSX, Racing, Review, Revolution, Ridge Racer, Sony. Bookmark the permalink.